The West Highland Way is Scotland’s most popular walking trail, with over 30,000 people completing it every year and many more coming to enjoy the beautiful scenery and cultural highlights seen along its way. The trail runs for 96 miles through ancient woodland, along loch shores and over mountain passes; all the while tracking centuries-old drove roads and military routes that have been witness to the wild history of the highlands. The areas it encompasses also play host to feral goats, deer and eagles alongside a wealth of flora – from the iconic thistle and ling heather through to the rarer, flesh-eating, sundew and butterwort. The scale of human activity along the trail, from day-trippers to thru-hikers, makes it almost inevitable that some litter and pollution follows. Even in the 1930’s – long before the West Highland Way was created – walking organisations were becoming aware of the potential problem. 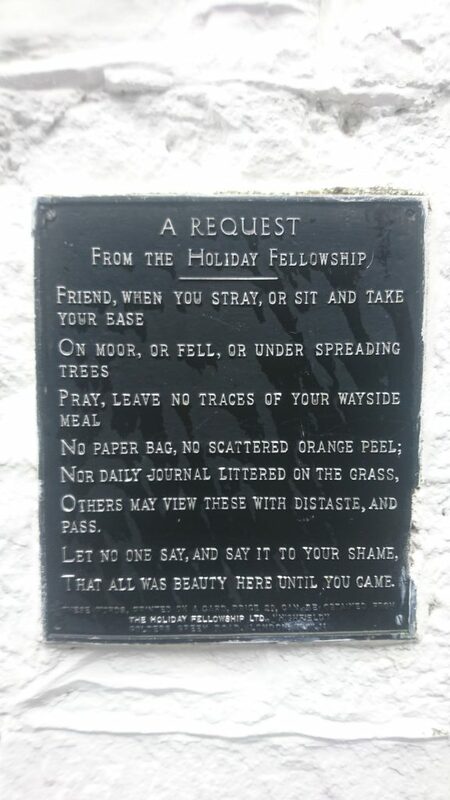 One company even went so far as to place lyrical warnings in various places, one of which can still be seen on the side of the Rowardennan Hotel at the traditional end of Day 2. Nowadays the impact of human activity on the natural world has been well documented but sadly litter and pollution persist. More recently the proliferation of micro-plastics in the world’s ecosystem has become a major source of concern and at Thistle Trekking we are committed to keeping all the trails we use clear of litter and as pristine as possible, both for the enjoyment of all those who walk them and to protect the myriad animals and plants that make those trails come to life. We are currently running our second West Highland Way walk of the season and most of the litter we have encountered has been small and scattered – the odd energy bar wrapper, clingfilm from a sandwich and so on. 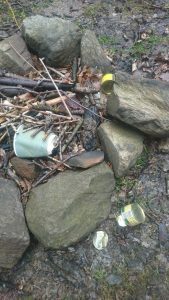 Our walking guide, Ed, has returned most days with a small pocket of litter that beady-eyed clients have spotted or which they have picked up en route. However, we have also encountered a few examples of some people’s astounding lack of consideration for the trail they are using and we are sharing these in the hope it will encourage others to think more about how they use the trail. 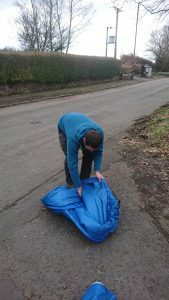 Ollie, our trek manager helping to pack a tent, abandoned with a bag of rubbish in the woods above Drymen. The remains of a fire and rubbish on the shore of Loch Lomond, this area is currently a prohibited wild camping area mainly thanks to irresponsible use such as this. 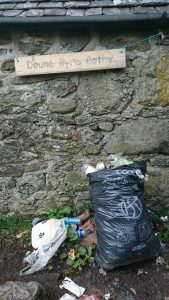 Rubbish outside the only mountain bothy on the trail, despite signs asking people to carry out their litter. Too big for our group to carry, this has been reported to the national park. It is still rare that we find examples of litter like this and we do our best to clear it when we do. Our hope is that our good example, alongside those of the many organisations who use and manage the areas through which the trail runs, will encourage others to do the same or otherwise think harder about their own impact on the environment. The West Highland Way remains one of the most iconic and stunning trails the UK has to offer and we hope that however you travel along it you will enjoy it as much as we do and do your best to help keep it as magical as it is.